The monkey tree (Araucaria araucana) is also known as the monkey puzzle tree and the Chilean pine. It is a tall growing coniferous tree that is indigenous to Argentina and the Andes Mountains. In its native habitat, the monkey tree can grow to between 50 and 100 feet tall. In the home garden it usually grows to a more manageable size of between 25 to 30 feet tall. Monkey trees can make for an attractive addition to your garden, just make sure you plant them well away from walkways since the needles can cause discomfort if touched. 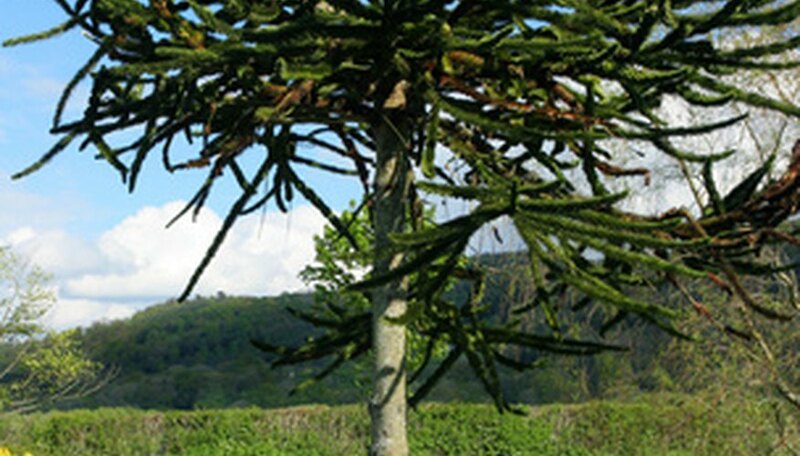 Choose a planting site for the monkey tree that is in full sun, to partial shade. According to Floridata.com, monkey tree does best when grown in regions where the summers are humid and cool. Eliminate all weeds and roots from the planting site using a garden hoe. Dig a 14 inch wide by 14 inch deep planting hole, if you are planting a monkey tree from a 1-gallon planting pot. If you are planting a monkey tree from a 5-gallon pot, dig an 18 inch wide by 18 inch deep planting hole. Amend the soil in the planting site according to the type of soil. Mix into the soil you removed from the planting hole approximately 1/2 cubic feet of coarse sand or perlite if the soil does not drain well or is heavy and clay-like. If the soil is sand-like or light, mix in 1/2 cubic feet of aged manure or dehydrated plant-based compost. Mix in sphagnum moss or leaf mold if the soil has adequate drainage and is fairly fertile. Cut along the sides of the planting pot, beginning at one of the drain-holes, all the way up to the rim of the pot, using a pair of multi-purpose snips. Do this at each drain hole until you can peel away the plastic to remove the monkey tree from its growing container. Scoop a few shovelfuls of soil back into the planting hole. Set the monkey tree into the hole. Inspect the tree to make certain it is sitting at the correct height. The top of its root system should be level to the surrounding topsoil. If the tree is sitting too low, remove it from the planting hole and scoop in soil until you are sure the monkey tree will be sitting at an appropriate height. Scoop in garden soil slowly, tamping it down with your foot as you fill the planting hole full with soil. Water the monkey tree with 2 to 3 gallons of water, if you planted from a 1-gallon planting pot. Provide between 6 and 7 gallons of water if you planted from a 5-gallon pot. Fertilize the monkey tree once a year, in the spring. Use a granular 12-12-12 or 15-15-15 fertilizer. Spread rates vary by manufacturer so read the directions on the products label in regards to how much fertilizer to use.